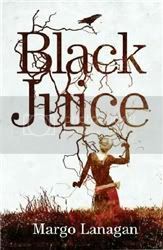 Black Juice is a collection of ten short stories that range from horror to fantasy and science fiction. You know that my definitions of these genres are inclusive and wide, but even so, even trying to label this collection feels artificial, because so much of Black Juice is unlike anything I’ve read before. These are stories that blur the lines, which is to say, my favourite kind. I don’t want to tell you much about the plots, not only because it’s easy to give too much away with short fiction, but also because most would be extremely difficult to summarize. Reading these stories felt a little like walking into an unfamiliar place blindfolded. I had to feel my way around them slowly, cautiously, word by word. And in case you’re thinking that this sounds like an incredibly frustrating reading experience, worry not: it absolutely wasn’t. The discovery was a pleasure, as was savouring Lanagan’s beautiful prose. Yes, many of these stories are vague. They demand your full attention; you have to notice the details to be able to make sense of what’s happening. But even when I wasn’t quite sure of what was happening plot-wise, I always knew what the story felt like. And that was more important than the plot. “Singing My Sister Down”, the story that opens this collection, is actually one of the most straightforward ones. It is also very nearly life-changing. It's narrated by a young boy whose sister is going to be executed for having killed her husband. The whole family is present at the execution, which takes place in a tar pit: the girl steps into it and the family stays with her the whole day until she finishes sinking. This brief summary might make you think that the story sound unusual, which it is, and that it's sad, which it also most certainly is. But it doesn’t tell you much about what makes it work as well as it does: you have to experience it, to feel it yourself. I cannot do it justice, but suffice to say that after I finished it, it took me nearly two weeks to recover and be able to pick up the book again. With this in mind, it might surprise you if I tell you that my favourite was actually “Sweet Pippit”. This story is told from the point of view of a herd of elephants who are on a journey to rescue a human boy they love, and there’s something about the narration itself that makes it so tender, so moving, so absolutely powerful. It reminded me a little of the way Kij Johnson writes about animals, and you’ve heard me gush about Kij Johnson before. There are other stories I could highlight – I particularly liked “Wooden Bride”, “Yowlinin” and “Rite of Spring”, and part of me wanted them to be novels. Not because they’re unsatisfying as short stories, but because the worlds they’re set in, though only hinted at, are so interesting, so rich and strange. The stories are full of odd little details that are never fully explained, but once again this is not frustrating – it leaves you eager for more, but not in a bad way. And then there’s “Red Nose Day”, which is one of the darkest and most shocking stories I have ever read — but not gratuitously so. It’s also one of the most demanding stories in this collection: not just because of the heavy subject matter, which involves murder, abuse and revenge, but because it’s particularly difficult to make sense of what’s happening at first. The emotions, however, are clear from the opening paragraph, and the build-up to the disturbing revelation about two third of the way through is absolutely perfect. Let me stop before I start gushing uncontrollably: Black Juice is original, haunting, tender and dark, and written in some of the most impressive and vivid language I’ve come across. I can’t wait to get my hands on Red Spikes. But our bearing is the sort that soothes others; we move with inevitability, as the stars do, as the moon swells and shrinks upon the sky. We brushed aside the wooden gatehouse as if it were a plaything we had tired of, and the other animals remained calm. Gooroloom tumbled it to sticks, and our feet crushed it to dust. Above the dark and swollen river of our rage, my delight in our badness hung briefly bright. We walked out among people’s houses, that were like friends standing beside the path. With every sleeping house we passed, I was more wakeful; with every step I took that was not circle-path, or earth we had trodden as many times as there are stars, something else broke open in me. My mind seemed a great wonderland, largely unexplored, my body a vast possibility of movements, in any directions, all new. Behind it, the night is suddenly vaster, colder, clearer. All the stars zing; the mountains glitter; towns and villages gather like bright mould in the valley-seams and along the coasts. Every movement in byre and bunny-hole, of leaf against leaf, of germ in soil and stream, turns and gleams and laminates every other, the whole world monstrously fancy, laced tight together, yet slopping over and unravelling in every direction, a grand brilliant wastage of the living and the dying. So I struggled up, shouting words that I mumbled, embarrassed, in front of Mum last night. They sounded powerfully pompous in our rough little home, but they suit this strong weather. They’re something to throw at the wind; words seem like nothing, but they’re tiny, fancy, people’s things. Who cares whether they do anything? What else can we put up against the wind except our tininess and fanciness? What else can the wind put up against us but its big, dumb, brute-strength? So there!, I tell it with my miniature mouth, my tiny frozen pipe of a throat, my stumbling tongue (and even the stumbling is good, for the wind never stumbles, never goes back and rights itself, don’t you see?). All you’ve got is your noise – and I’ve got noise, too! And mine’s a thing of beauty! I don't like reading whole story collections - for some reason they really tire me out - but i think I'd like to get my hands on this to read one story every once in awhile (until eventually I've read them all). First I put myself on this book buying ban, and then to make matters worse, I tell myself I have to finish all these big non-fiction books that I have started for school before I start anything else. Essentially, I put so many rules on myself that I've sort of stopped reading. Why am I punishing myself this way? I think I'm on the verge of saying to hell with all my stupid rules and grabbing this book off the shelf. Goodness knows you've made me want to!!!! And hey, on a side note, I think I now have the guts to read Tender Morsels. Reading these stories felt a little like walking into an unfamiliar place blindfolded. I had to feel my way around them slowly, cautiously, word by word. YES. When it works (like in "Red Nose Day" and "Rite of Spring"), it's an incredible effect. When it doesn't (see "Perpetual Light"), it feels as though you're bumbling around your flat at 2 a.m. with no lights on, stubbing your toes on the furniture. Still, Lanagan can turn a phrase. I love this bit from "Earthly Uses": With the first bite of the spade into the earth, there's something different, juicier, lumpier than it should be. When I turn the soil, giant pearls fall out of it; some roll away; others, split by the blade, gleam white and wet in the starlight: tiny potatoes, no bigger than quail eggs, thousands of them. They're grown so thickly, I have to not so much dig them as sift the soil out from smong them with my hands. I eat one, and it crunches like wet stars but tastes like sweet earth. It needs no salt or softening; it needs nothing but a mouth that's ready. Hee hee. She is amazing, isn't she. So glad you like Black Juice. I love haunting, and I love blurred lines, so I think I'm sold. Execution via tar pit? OMG. And anything with elephants wins my vote. I have a soft spot for elephants. You read the most interesting things Ana. I very rarely read short story collections, but this one would sway me. The story of the girl being executed in the tar, sounds so sad. Yet I know I would like to read it. I must jump on the bandwagon and read this author!! I'm reading blogs at work today and thought this title sounded familiar...we have it!! Happy Dance! I just checked it out to myself...Thanks Nymeth! This story collection sounds like quite an intense read - definitely very haunting. "Singing My Sister Down" sounds very intriguing and definitely very sad. This's right up there on my list of Stuff I Wanna Read. I've read a couple of the stories already, since they made it into a volume of THE YEAR'S BEST FANTASY AND HORROR, and they definitely made me want more. I think you're spot on with your description of Lanagan's stories and their effect on the reader; reading them is like roaming around with a blindfold on, but it's one hell of a ride nonetheless. I really need to read her! I have had Tender Morsels out from the library twice and still haven't read it! I think it would take me a lot longer than two weeks to recover from "Singing My Sister Down" but oh, my, the "discovery" of reading this writer sounds incredible. I will have to find her work. Thank you. I think I'm going to read this. I'm with Viv on the story about the girl being executed in the tar. Oh yay I have this :D And I wants to read it now. What the hell is wrong with me Ana??? I still haven't read Tender Morsels!! Ok...I think it's going to be my first read for the readathon this year for real. Do you think it's manageable for the read a thon? Tender Morsels that is? I read Nation for last Octobers...so I'm thinking if I could read that one for the read a thon I should be able to do Tender Morsels, right? Sounds really good, I'm not into short stories much but somehow I love short stories in horror. I keep meaning to read more short story collections. This one sounds like one to add to the list. Some of the best stories often require full attention! This set of stories sound very interesting! You always read the best books, Nymeth. I love stories that really get under my skin--the ones I can feel. This sounds fantastic. WEll, except for the tar pit....I'm not to sure about that, as I've always had a fear of drowning. From your review, the book does sound dark. I'm just beginning to read collections of short stories - this one will be on my list. wow, this does sound good. the Tar Pit story does sound very sad. The cover and the fact that this is short stories that blend across favorite genres had me sold even before you gushed about it! Once in a blue moon I despair that I'll one day run out of short stories of the kind I particularly enjoy. Such a foolish feeling, I love that this medium continues to be explored. Sounds like a pretty powerful collection! Lanagan is such a wonderful writer - and these stories sound fantastic! Wow. I have not read Lanagan, but your description of her work is wonderful, and the cover very enticing. I am struggling a great deal with reading at the moment, being so busy at work, planning the party, trying to move house and to top it all being quite ill for the past few weeks, so it encouraging when I get excited about a review. Thank you for that. And I promise to try and finish Piece by Piece as soon as I can. Amazon keeps recommending Red Spikes to me, and I'll admit that I'm thinking about giving in, but this collection sounds really excellent as well. This is my favourite of Lanagan's books. Well, that I've read so far anyway :) Sweet Pipit was my favourite too, I just loved the way she uses language. I definitely agree with you on "Singing My Sister Down". The beauty of the rhythm of the language used in the book is just so . . . breathtaking. Great review. I'm not normally a short-story person, but these sound interesting. Also, I just finished Neil Gaiman's Smoke and Mirrors, and really enjoyed it, so I am feeling much more game for short stories these days. Amanda: I always really them much more slowly than novels, and I made this one last about two months! I'd recommend it to you for the writing alone. Loren Eaton: lol! Luckily I had no toe-stubbing incidents. And that too is a wonderful passage. Tracie Yule and Sandy: Sweet Pippit is such a wonderful story - and so completely unlike everything I'd read before. I have a soft spot for elephants myself. Vivienne: It's an unforgettable story! Belle: It went straight to my list of favourite short stories! Renay: I can't wait to hear what you think! I'd actually been reading this since...August, I think? It's one of those collections that are probably better enjoyed if read slowly. Mee: Australia has the best authors! ds, I hope you love it as much as I did! Alice: It was so sad and unforgettable and beautiful at the same time. Chirs: You know the last thing I want to do is discourage you from reading Tender Morsels, but I'm not completely sure if I'd recommend it for the read-a-thon. First because it's slow - the writing is dense and demands your full attention. And secondly because it's one of those books after which you'll probably be unable to read anything else! Violet: These are different from most horror fiction, and some of them aren't even horror at all...they're all quite dark, though, and very hard to forget! Carol: So do I - I have read so few this year! Jill: I'm terrified of drowning :S But somehow that made the story work even better for me. Josette: I'm in love with the cover art myself! Naida: It was sad and tender and beautiful and I don't even know what else...so many emotions in only a few pages. Darla: Isn't she? I'm so glad I discovered her. Mariel, don't worry about Piece by Piece! Take your time! Fence: It's quite something, isn't it? Tender Morsels is my favourite, but then again I've always preferred novels to short fiction! Vasilly: Yes - breathtaking is the word! Dreamybee: You know, Smoke and Mirrors was one of the books that got me hooked on short stories! I read them very seldom before I discovered Neil Gaiman's. I usually prefer novels to short stories too, maybe its the fact that Black Juice was the first book by Lanagan that I read that makes it all the more special. Ok, based on how you felt about this book and the quotes you provided, I am going to be grabbing a copy this week. It sounds like there is some really beautiful imagery in the book, and that some of the stories were boundary pushing. Since I have a little bit of a hard time picking short story collections, I am going to be taking your recommendation and reading this book. As I read your review, I really wanted to read this -- especially "Singing my sister down". Imagine my surprise when I discovered my library had this book. I've now read the story and I agree that it is stunning. Ahhhhh! After reading your review I'm now doubly sad that I had to return this to the library without reading it.